Tailored Project Management Training Indianapolis - Enterprise Consulting, Inc. There are many different project management methodologies available, each touted as having some special ingredient or suitability to managing a project. From a traditional project management perspective, there can be a tendency of excessive planning, which can drive a project into the ground. At the other end of the spectrum, agile project managers feel that any form of project management is a waste of time and can stifle a project before it begins. Project managers often attempt to force a project to a given project management methodology because it is the most familiar. Forcing all projects into the same project management methodology is a significant risk to the project brought on because of the limitations of the project manager’s lack of exposure to alternative project management approaches. To off-set the common problem of using a specific project management methodology, the Tailored Project Management® model identifies specific strategic goals for training project management practitioners how to select which project management practices best fit the requirements of the project. Tailored Project Management® is the interaction between the flow of knowledge into the flow of work. The flow of knowledge represents the vertical processes depicted in the knowledge areas in the PMBOK® Guide. The flow of work represents the horizontal processes depicted in the five project management processes of initiating, planning, executing, monitoring and controlling, and closing. Tailoring is modifying existing project management processes currently in use by the organization to meet the specific needs of the project. Tailoring assists in selecting project management practices based on the size, complexity, and uncertainty of the project. At the heart of the Tailored Project Management® model is the TPM Assessment®. The TPM Assessment® is an attribute-based survey for assessing an organization’s current and future project management practices based on the PMBOK® Guide’s standard of knowledge areas. 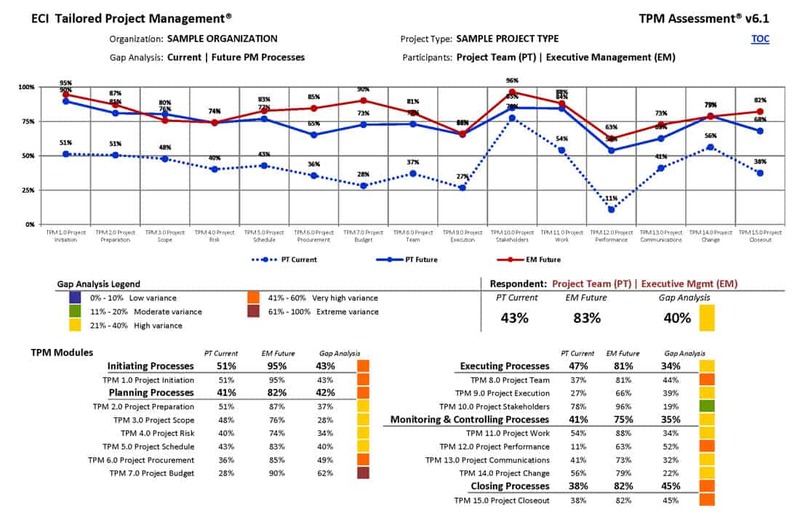 The TPM Assessment ® identifies the difference between the organization’s current project management practices and the organization desired state of project management capability. The TPM Assessment® measures if specific project management process are performed. The results are used to formulate an organizational-wide project management training program. The TPM Assessment® provides a holistic, process approach for implementing a tailored project management methodology by identifying what project management processes provide the greatest value based on organizational and strategic needs.. Contact Dr. Stephen Burgan, PMP sburgan@ecitpm.com for further information on having a TPM Assessment® done of your organization. According to a recent study conducted by the Project Management Institute, some 15.7 million new project management roles will be needed to be created globally by 2025. However, many organizations are ill-prepared to handle this, both from a capacity and a skills perspective. In response to this growing demand, the Tailored Project Management® Training Course & Workshops helps individuals, project teams, and organizations in implementing and/or improving their project management practices. Built on fifteen years of research, we have developed a series of training modules that can accelerate the successful implementation and use of project management practices within an organization. Tailored Project Management® Course provides individuals and organizations with the knowledge and skills to implement a set of project management practices to achieve an organization’s strategic goals. 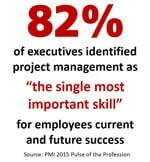 Contact Dr. Stephen Burgan, PMP sburgan@ecitpm.com for further information on having a Tailored Project Management® Training Course customized for your organization. Tailored Project Management® Workshops are an alternative way for individuals or project teams to gain the skills employers’ desire. Participants work on specific skills or knowledge until they can demonstrate their understanding and the ability to apply them. The workshops are comprised of action learning events, or “learning by doing.” Action learning closes the skills gap between the experience an individual has and their ability to transfer the learning to their work environment.